I would recommend this. Beautiful. Great fabric. Has held up wonderfully. Have a king in our bedroom, bought 2 more (queen) for the beach house. Love them. 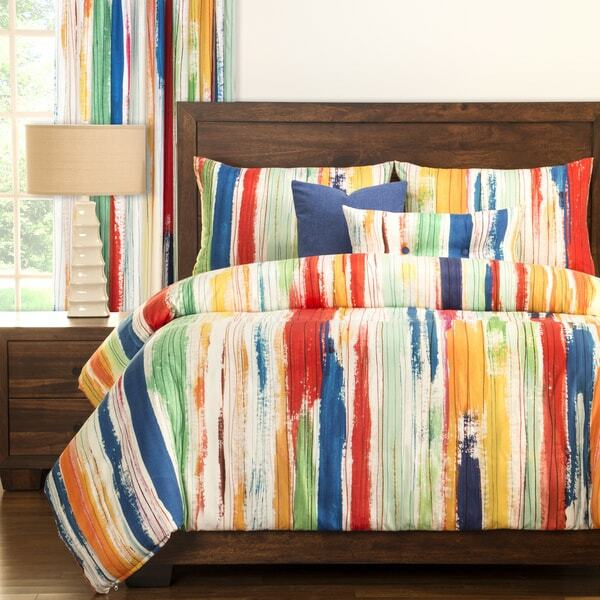 Vibrant and bold, this chic Sketchy Stripe six piece duvet cover set will add a dash of flair to your bedroom. The ultra soft feel and cozy, eco-friendly down alternative comforter fill make this set as comfortable as it is attractive. The fashionable set features one duvet cover, one comforter, two toss pillows, and two pillow shams (single sham only included in the twin set). The digitally printed pattern is designed to show the brushstrokes of the original hand-painted work. The duvet cover and shams have zippered closures for easy cleaning. Eight buttons firmly secure the comforter inside the duvet cover. This easy to maintain set is also machine washable. Unique and luxurious, this attractive comforter set will add color and life to your bedroom. Colors are vibrant and exactly the ones I need. However, the comforter is not wide enough for my bed. But it is hard to find ones that are big enough for these thick mattresses. Great quality. My husband and I have been updating our house with primary colors to brighten up our space. This Duvet set goes perfectly with our new plan! Love the colors in the sketchy stripe . Great quality. It was exactly as it appeared on line. Good colors and good quality, but if you live somewhere hot like I do in Texas you will want to take the duvet because it is hot. Love this item. Generously sized. I do find the white is more like winter white than pictured, but everything is exactly as pictured. "Is there a matching shower curtain?" No, a matching shower curtain is not available. "can u omit the comforter? i only need the DUVET COVER & the rest in the set. " This is not available in a comforter, the duvet set cannot be sold separately. "Is this duvet cover reversible?" Yes, it can and when you receive the set, the comforter insert is already in the duvet cover, which is great. The fabric is soft and the colors are true to the picture on line.